Now that mother nature has hopefully decided to cooperate with Spring, it’s time to think about refreshing your wardrobe. When I was little Easter marked that official start of Spring for my family and my mum would give us a new outfit in our baskets each year. I loved the tradition and as an adult I look to this time of year to break out the cute maxi dresses and comfy shorts! To help get your creative juices flowing as to what to update I’ve created a handy little guide for my favorite spring wardrobe essentials. Whenever it’s a new season I like to take inventory of the clothing items I have in my closet and toss or donate any items I don’t wear anymore. ThredUp is a great online thrift store you can sell your gently used clothes to – meaning you’ll earn money to spend on new items you’ll actually wear! Once you have a clear view of what you have and what you need you’ll be able to start jotting down a list of your must haves. The foundation to any Spring wardrobe. I’m a sucker for a good jean short and this year I’m loving the looser boyfriend cut styles. Paired with a t-shirt or a cute blouse they are versatile enough to wear day or night. And let me just let you in on my favorite shorts of all time – pull. on. shorts. They are seriously the most comfortable shorts and the elastic band keeps them from riding up. T-shirts are my jam and they are great, but I’m trying to make more of an effort to branch out. Typically t-shirts were more go to because they were comfortable and no body wants to me uncomfortable on a warm spring afternoon. However, now days comfort and style go hand in hand – from a cute basic cami to a button down linen shirt. You really can have it all. Awe sweet sweet dresses, how I love you! Seriously being able to wear dresses again makes me jump for joy and dresses make getting ready in the morning a breeze. From maxi to t-shirt to shift, there’s a dress for everyone and every occasion. This season I’m loving longer length dresses – you look lady like while staying cool. No spring outfit is complete without a little bit of accessorizing. Hats can be taken from winter in to spring, just update the material. Now is the best time to find your perfect pair of shades and scarves. I’m from Florida so I’m pretty limited on how many days out of the year I can wear a scarf so I like to take advantage of the “cooler” weather and wrap a light weight scarf around my neck for an extra pop of color (or pattern) to my outfit. 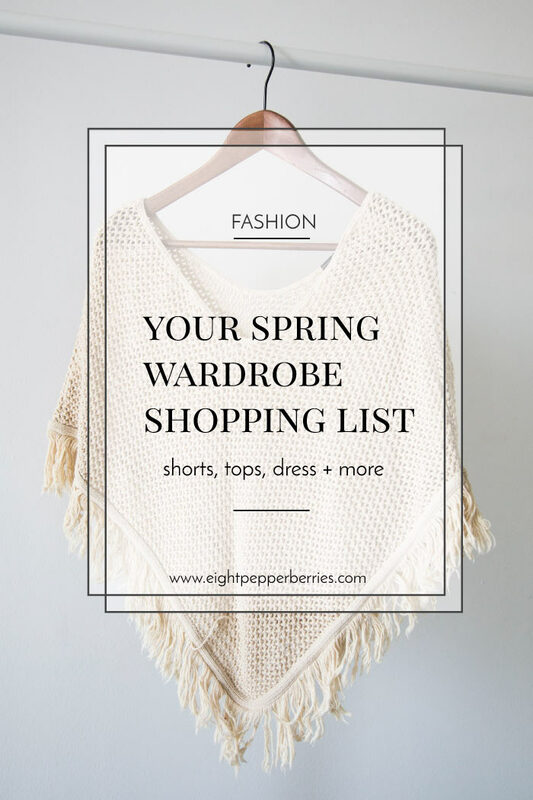 What must have spring wardrobe pieces are you adding to your shopping list? !